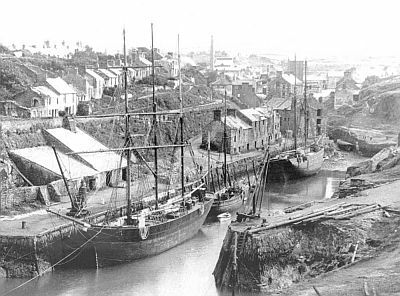 The ship yards of Treweek and William Thomas produced many vessels in the C19th. They started with the repair of sailing vessels such as the Hero but later built both wooden and steel sailing and steam ships. 1826 Marquis of Anglesey 65 N.Treweek Sloop 1826 N.Treweek Capt Hugh Thomas. .
1840 Economy 60 Treweek Bros Schn 1840 N.Treweek Capt R.Jones. 1858 Mary Catherine 77 Hughes & Co I.Schnr Jones& Co Amlwch Capt J.German First iron ship built at Amlwch by William Thomas in 1858 on the western side of the port. The owners were Jones and Company, Amlwch. Captain John German. 1859 Grace Evans 90 Treweek & Co I Schnr N.Treweek, W.Thomas, Grace Evans, E.Morgan etc. Capt J. Price The first two-masted iron schooner was launched from Treweeks yard in October 1859 with Nicolas Treweek ,William Thomas , Grace Evans and Edward Morgan,tobaconist each having ¼ share in her. 1865 Jane Gray 124 Paynter Schooner Sunk by enemy action 1915. 1870 Lewis and Mary 70 Thomas Schooner 1870 W.Thomas, E.Pritchard Capt E.Pritchard. Sailed from Antwerp for Greenock in 1874 and was lost at sea. 1871 Charles 48 Paynter For Charles Dyer the Parys mine agent. 1872 Holy Wath 99 Thomas Schooner 1872 Morgan & Co Whitehaven 1875 Built at Amlwch in 1872 by Captain Thomas for William Morgan of Cumberland. 1876 Lady Neave 89 Thomas Schooner 1876 W.Thomas, W.Owen, I.Jones Capt I.Jones. served in the coastal trade until sunk in a collision in July 1911 near South Stack. 1877 Nant Glyn 103 Thomas wood Schooner T.Jones and T.Jones Lost all hands in October 1881. 1878 Eilian Hill 99 Thomas Schooner 1878 W.Thomas, L.Hughes etc Built by Thomas with Charles Henry Hills as joint owner. 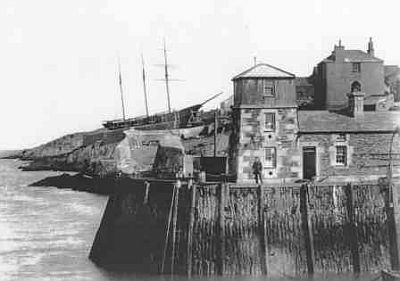 In December 1882 she foundered off Penzance after colliding with SS Equist. 1879 Glyndwr 26 Thomas Smack 1879 W.Thomas Capt W.Williams. Lengthened 1882.she carried various cargos alone the North Wales Coast. 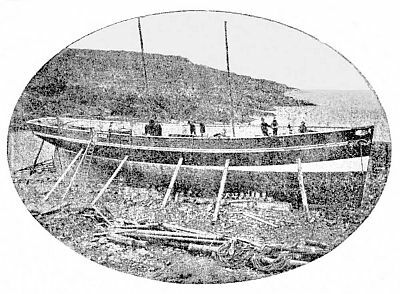 Went ashore near Point Lynas may 1883. Wrecked near Hoylake 9/1/1886. 1881 President Garfield 48 Thomas Schooner 1881 W.Thomas jnr Sold in 1897 to Cornish owners. 1883 W.S.Caine 74 Thomas I.Dandy Stmr 1883 W.Thomas, then W.Thomas Liv then Manchester, Liverpool and N.Wales SS.Co Capt L.Thomas First Iron screw steamer to be built at Amlwch by Thomas she was 180 tonnes and was built for a contract price of £5000 in 1883. 1884 Exchange 292 Thomas I.stmr 1884 W.Thomas & Co, Liv Capt A.Grant. Captain Thomas Davies in 1900. 1887 Gelert 223 Thomas I.Schnr 1887 W.Thomas, L.Thomas Wrecked Catalinita Is 26th April 1890. 1889 Eilian 116 Thomas Schooner 1889 W.Thomas & Sons, R.Griffiths Sank 6th July 1899 after a collision with SS Afrique off St Catherines Point. 1890 Prince Ja Ja 271 Thomas S. Screw 3 mast 1890 Liverpool and Menai Strait SS co Ltd Capt J.Richardson Spent many years in the Menai Straits carrying miscellaneous goods for shop keepers. 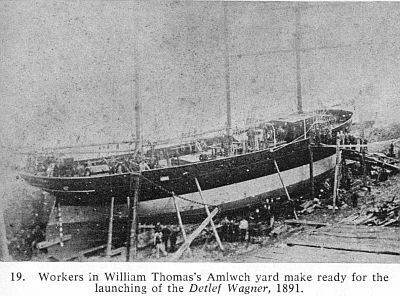 1891 Detlef Wagner 225 Thomas I.Screw Bkn 1891 H.Baumann A well known European vessel. She was sunk by a submarine in 1917. She was named after her owner, a ship broker in Hamburg. 1904 Becca & mary Hugh Jones for the Duddon Shipbuilding company in 1904. Donald and Doris Paynter Schooner Hodborrow Mining Co Capts Wynn and Jones.For the Hodbarrow mining company. Eilianus Thomas Steam vessel wrecked off Cornish coast.